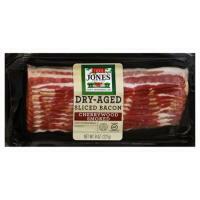 Jones Dairy Farm Bacon is smoked with real hickory chips for a truly authentic flavor. Made with only the center cut from a pork loin, our Certified Gluten-Free Canadian Bacon slices are a great source of lean protein, with an impressive 11g per serving. A three-slice serving also contains just 60 calories and is 97% fat free.